Use this utility to save your company time and money. By adding one line to a users login script or running this program from the network remotely, you can report on lots of information about their machine. 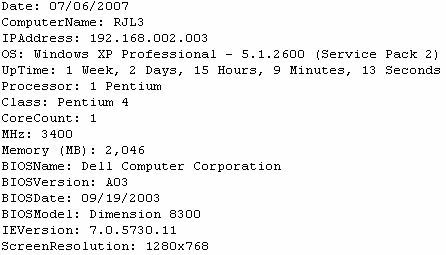 Log Info can log Hardware and Network information, Operating System data, Processor types and MHz, RAM, HD sizes, MAC Address and much more! Log Info can write this information to a comma-delimited file that is perfect for importing into Excel, Access or any SQL database. It can also write out to a readible report-type file for printing or archiving with the computer. With the Configuration module, it allows you to select exactly the information you want logged and where it is logged to. Log Info works in your server login scripts with one simple line addition, or you can run it from any other media type. If you ever needed to inventory your department or companies machines, this utility is a must have time saver! All of the computer data from all of your machines could be consolidated into one simple flat file or to individual files based on computername and username. Log Info also comes with a small Log File Viewer (viewer.exe) to quickly display the contents of your current audit. Log Info is very simple to use. Run our Configuration Editor (config.exe) and choose what information you want to audit and where to send the output. Then copy the loginfo.ini and loginfo.exe to a shared location on your network and run it remotely to collect all of the computer data. It is that simple! Great utility to assist in end of the year budgeting for new equipment, gathering computer assets or simple company audits. Easy to use tool for help desks, managers, supervisors and even non-technical personnel. The time you will save with this utility is immeasurable, but don't take our word for it! Download our 100% fully functional shareware version. Click here to download Log Info v2.11 . This output is great for importing into Excel, SQL Server or any other type of enterprise database system. To learn more please view the other screenshots of Log Info. If you are interested in login script utility software, take a look at our Message Manager Deluxe product.